Location of the peaks. The location of the peaks is determined by the angle the sound horizon subtends at last scattering. In an open universe, geodesic deviation makes this angle much smaller than in a flat universe. As this angle involves a ratio of the sound horizon to the (angular diameter) distance to last scattering, distance scale changes through $\Lambda$ and $h$ have little effect on its angle. The drop in the lowest multipoles for the open $\Omega_0=0.1$ is due to the lack of supercurvature scale power in the otherwise scale invariant initial conditions assumed here. Models here have $h=0.5$ and $\Omega_b=0.05$. Parameter sensitivity. A schematic representation based on a scale invariant adiabatic scalar model. Features in an open model are shifted to significantly smaller angles compared with $\Lambda$ and $\Omega_0=1$ models, represented here as a shift in the $\ell$ axis. 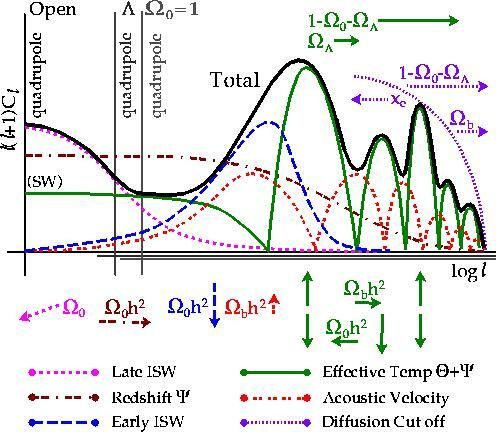 Isocurvature models behave similarly with respect to the acoustic oscillations save that the peaks are 90 degrees out of phase. The spectrum may also be tilted by changing the initial power spectrum from the scale invariant assumption. Gravitational Wave ISW Effect. The metric distortion caused by a gravitational wave induces a redshift/dilation effect on CMB photons. 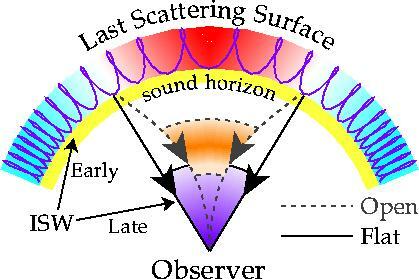 The spectrum is cut off below the angle subtended by the horizon at last scattering since gravity waves only affect free streaming photons significantly. Due to the signature of the metric distortion, it originates as a source of the quadrupole anisotropy.